With songwriter Jason Mraz, everything's four-letter words these days - his surname, his new album and his new tour, for example. This year's 'Love is a Four Letter Word' is actually his fourth studio album and promises to be his fourth Billboard Top 200 hit, excluding his live albums. But here in the UK, despite recording for over 10 years, Mraz has gained more notoriety for his Czech-derived surname, than for a long string of hits and awards. 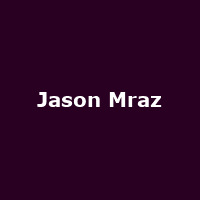 Back home in the States though, Jason Mraz's breakthrough came relatively early in 2005 with the #5 album, 'Mr A-Z', which featured minor hits 'Wordplay' and 'Geek in the Pink' - the rest of the world took a little longer. In 2008, a sprightly single 'I'm Yours' crossed him and his mellow and carefree hybrid of personal easy-going tunes over to a much wider audience, reaching the Top 10 in nine countries, including two #1s. The accompanying album, 'We Sing. We Dance. We Steal Things. ', almost repeated the same feat. Now, some four years later, his new full-length set will see the light of day next week, some seven months prior to his only UK show! Prior to coming to the UK for his brief stopover, Mraz will be performing around the US and Europe with his 'Tour Is a Four-Letter Word', before hitting London's O2 Arena on 1st December 2012. This huge show will go on sale from 9am on Friday 13th April - it'll be lucky for some who can get tickets though because Jason's last UK tour dates, in 2008 and 2009, sold out (and that included the Royal Albert Hall and two nights at the Hammersmith Apollo). Prices start at £32 for all seats.